Thanks everyone for your kind comments you’ve left – as the doctor said the other day, I think there are a combination of forces at work with my headaches … I haven’t been eating, but been drinking more than normal (which is a good thing), and I’ve been very sinusey – added to the fact I’ve been spending way too much time on the computer of late (‘cos I’ve been too tired etc to stitch), and the fact I wake up every morning feeling like I haven’t slept … so, plenty of things to try and hit on the head! Then Mum gave me some great news on the phone – she’d been ploughing through my piles of stash that’s still back at home in NZ (gee, I miss it!! 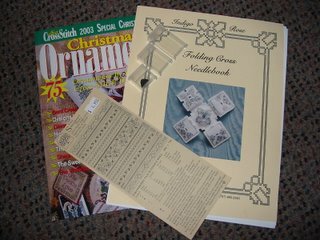 ), looking for something I’d asked her to find, and she came across another JCS ornament issue I didn’t remember I had – 2000. I’ve got issues 2001 & 2002 coming as part of my order in the above S.E.X.-fest, which means I’ve now got 1998-2005 yippee. Considering this year is the first year I’ve attempted to even start any of these, I really have no excuse not to now – there are oodles to choose from! Seeing as my Xmas tree is only relatively small, I’m thinking of hanging my old toy ‘teddy chains’ up from the curtain rod, and hanging my ornaments from that (thanks Mum for the great idea!) – yet something else for Mum to pack and bring when she comes over to visit. I was originally going to have a ‘metal tree’ on my dining table, that has scrolls you hang ornaments on, but they’re all too small. I’ve suggested Mum should just leave some clothes etc here, then she’ll have an empty suitcase to come over with, so I can fill it in its entirety next time hahaha. Anne S • This entry was posted in Stash and tagged Stash. Bookmark the permalink. ← Headache, headache, go away!!! I miss my stash back home in Australia too 🙂 Although I’m doing a pretty good job of building one up here …. mmmm, maybe I should think about going on The Wagon next year too – LOL! Sorry to hear about your health issues… hope all the changes you’re making will help sort you out. You could try drinking the water from a sipper bottle – not being a water lover myself, I find it soon goes down sipping here and there. That frame for Zebra is perfect! Congrats on your bargain. I hope those headaches go away soon! Shift work is bad news, I know ‘cuz I used to do it. It is hard to stay healthy when your sleep schedule changes frequently. I hope the glasses help – what a smart idea to try them out! Couldn’t hurt, huh? 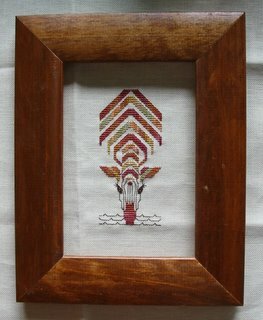 The new frame for your zebra piece is just perfect! What a great find. Anne- Do go shopping for new pillows. A few months back I was having a terrible time sleeping and would wake up with headaches – took awhile to figure it out, but my pillows just weren’t providing the right kind of support. It may cost a bit of $$ but get some good ones – you’ll be glad once you start sleeping and wake up feeling rested. Good luck. Anne: Love the zebra — think it will be cute in the frame. (do you think it is a giraffe?) Sorry to hear of your headaches. Take care of yourself. PS Your stash is excellent. Will be great fun to start the 2006 SALs. 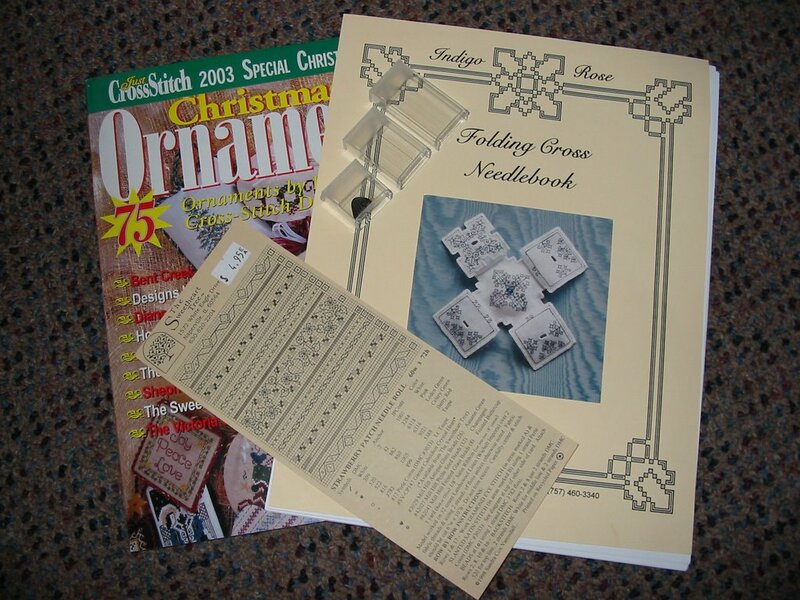 I’ve got folding Cross in my stash and am looking forward to the Stitching smalls SAL on it. I need to drink more water too..here is a tip I have forced myself to do. Have a bottle of water beside where you stitch. Every time you finish a thread, have a drink. You will be surprised how much you will drink…then you have to go to the toilet and you can refil your glass again!